Over 10 years ago, (I'm sometimes not so sure which year. ), I ran into Twisted X Boot Company at the WESA trade show in Denver, Colorado. They invited me to come in and try on a pair or two. I did. From the first pair, I knew this boot company knew how to make a high tech boot. Everything most of us need in support, comfort, and looks were incorporated into a non traditional performance boot. This is a better boot at a moderate price because of the savings made in state of the art production methods. Seems the boot's chief designer has built styles with both Justin and Ariat, before making his own venture. His dream is to combine the best of all worlds into a uniquely great product. Once you wear a pair, you'll agree that Twisted X Boot Company has become a leader in footwear design. 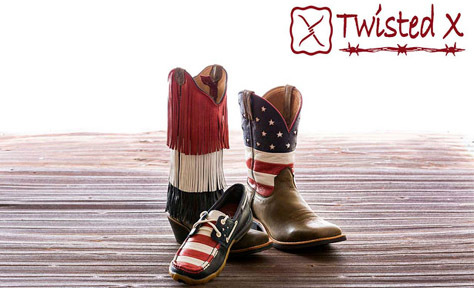 Twisted X Boots include traditional and authentic looking cowboy boots, western boots, and work boots. Recently they have taken their comfort technology to casual shoes too. The technology inside and outside gives you a more stable, durable, lightweight experience. It breathes as it should, to allow dissipation of foot moisture. And the comfort factor is one you just need to feel for yourself. 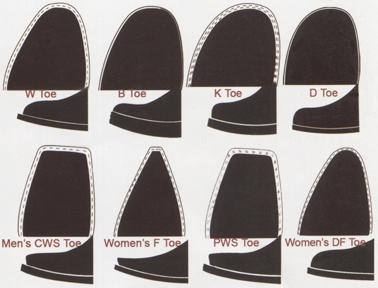 Fitting is consistent in each boot because all last measurements are from ball to heel. 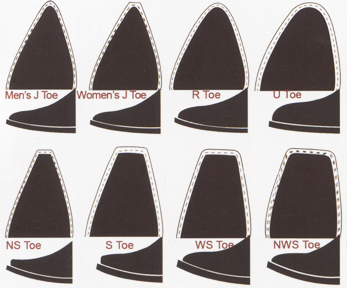 So, if you're changing toe styles, keep your same fit. Bob Frazier and the "Twisted X Bunch" state that they have been at this for a long time, and that this is the best overall boot package they have been associated with. And, they promise to continue searching out the newest and best components available for your footwear. The boots are cut generously in size. They allow comfortable room for your arches. Until they break-in, Twisted X boots will slip on your heels. ( In fact they are always going to slip a little, the design is different than a short quarter shoe, so the slipping will not rub blisters on your heels. See the next paragraph too.) More flexible soles have been incorporated into the Twisted X shoes, so you don't get rubbing there either. Consider this high quality footwear for your wife & children too. The bones of a child's foott will form only as well as you allow. Lack of arch support, cramming a growing foot in an outgrown shoe or boot, or even consistently wearing way too big - either can deform foot bones permanently. (Some growth can be allowed, especially with a good insole added to start. But you want to fit the arches, the metatarsals. ) Proper foot care will pay tremendous dividends in all the years to come. Cheap made shoes create all sorts of problems years from now. And soft bottom tennis shoes, designed for certain active sports, requiring maximum flex and thereby giving up much arch support, were never made to wear all day. Although the bottoms of today's Twisted X Western boots are much more comfortable than many of 25 years ago, they still have proper arch support, ankle support, toe room, and all the guts that make a real cowboy boot. A mix of Leather & Performance outsoles on High Tech Cowboy Boots. Click below for lots of choices, depending on your needs! 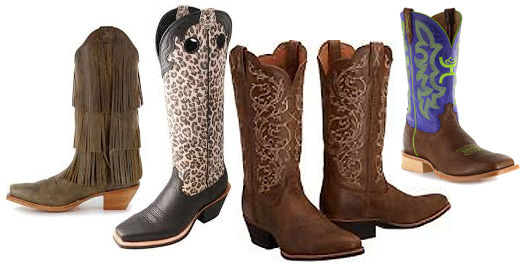 A vast assortment of favorite Fashion & Ladies Boots. You won't believe this assortment till you see them. These boots look like real Cowboy, Cowgirl, and Work boots because they are! you'd never buy anything but Twisted X Cowkids Boots. Click below for lots of Youth & Children's boot choices! For the toughest of jobs. Durable built soles, still comfy. Click below for lots of choices in Men's, Women's, and Kid's, depending on your needs! 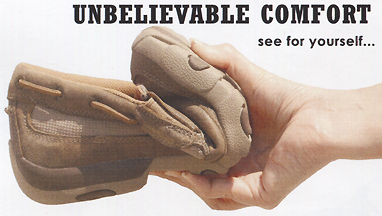 OK, we finally believe Twisted X can deliver body support in these Chucka boots, Driving Mocs, and Casual "shoe-boots". It has been the rodeo cowboy that has convinced us to offer Twisted X Casuals. Built with many of the qualities you expect from adult boots. Try a few pair. Lots of selection. We even talked Chuck into a Chucka! Move over Minnetonka - There's a new "Sheriff X in town! Easy orders, shipping, info Click Here!